Shih Tzu puppies are happy, outgoing and friendly and great with children. ShihTzu's are one of the breeds bred entirely for companionship. Bonding with the whole family Shih Tzu puppies make excellent family pets, with minimal grooming and walking requirements – every home should have one! In the world of those who know, Shih Tzu is pronounced ' sheed zoo', and in Chinese it means 'Lion Dog'. The ancestors of this sprightly dog are Tibetan Temple dogs. Carefully bred in the Imperial Palace and showed a likeness to the Lion, an important Buddhist symbol. 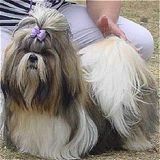 The Shih Tzu features heavily in Buddhist mythology and was believed to be the animal that Buddha himself kept as a pet. Loves family togetherness and bonds with the whole family, excellent with older children, but due to his extreme sense of self worth can tend to be jealous of babies and toddlers and is not recommended in such families. Shih Tzu puppies have attitude and will do their best to convince you they should be treated like a King! If allowed to, they will cry to be spoilt – this must be trained out at an early stage with much socialising and consistency with assertiveness. Discover How to make your Shih Tzu happy healthy and obedient!